The National Research Council has released a report* on lessons learned from the Fukushima nuclear accident that may be applicable to U.S. nuclear plants. The report begins with a recitation of various Fukushima aspects including site history, BWR technology, and plant failure causes and consequences. Lessons learned were identified in the areas of Plant Operations and Safety Regulations, Offsite Emergency Management, and Nuclear Safety Culture (SC). This review focuses on the SC aspects of the report. Spoiler alert: the report reflects the work of a 24-person committee, with the draft reviewed by two dozen other individuals. ** We suggest you adjust your expectations accordingly. The SC chapter of the report provides some background on SC and echoes the by-now familiar cultural issues at both Tokyo Electric Power Company (TEPCO) and Japan’s Nuclear Energy Agency. Moving to the U.S., the committee summarizes the current situation in a finding: “The U.S. nuclear industry, acting through the Institute of Nuclear Power Operations, has voluntarily established nuclear safety culture programs and mechanisms for evaluating their implementation at nuclear plants. The U.S. Nuclear Regulatory Commission has published a policy statement on nuclear safety culture, but that statement does not contain implementation steps or specific requirements for industry adoption.” (p. 7-8) This is accurate as far as it goes. After additional discussion of the U.S. nuclear milieu, the chapter concludes with two recommendations, reproduced below along with associated commentary. In the lead up to this recommendation, there was some lack of unanimity on the subject of whether the NRC was sufficiently independent and if some degree of regulatory capture has occurred. The debate covered industry involvement in rule-making, Davis-Besse and other examples. We saw one quote worth repeating here: “The president and Senate of the United States also play important roles in helping to maintain the USNRC’s regulatory independence by nominating and appointing highly qualified agency leaders (i.e., commissioners) and working to ensure that the agency is free from undue influences.” (pp. 7-14/15) We’ll leave it to the reader to determine if the executive and legislative branches met that standard with the previous NRC chairman and the two current commissioner nominees, both lawyers—one an NRC lifer and the other a former staffer on the Hill. Snarky comment notwithstanding, the first recommendation is a motherhood statement and borderline tautology (who can envision the effective negation of any of the three imperative statements?) More importantly, it appears only remotely related to the concept of SC; even at its simplest, SC consists of values and artifacts and there’s not much of either in the recommendation. At least transparency is a cultural attribute. We have long opined that the nuclear industry’s penchant for secrecy is a major contributor to the industry being its own worst enemy in the court of public opinion. This report looks like what it is: a crowd sourced effort by a focus group of academics using the National Academy of Sciences’ established bureaucratic processes. The report is 367 pages long, with over 350 references and a bunch of footnotes. The committee’s mental model of SC focuses on organizational processes that influence SC. (p. 7-1) I think it's fair to infer that their notion of improvement is to revise the rules that govern the processes, then maximize compliant behavior. Because of the committee’s limited mental model, restricted mission*** and the real or perceived need to document every factoid, the report ultimately provides no new insights into how U.S. nuclear plants might actually realize stronger SC. 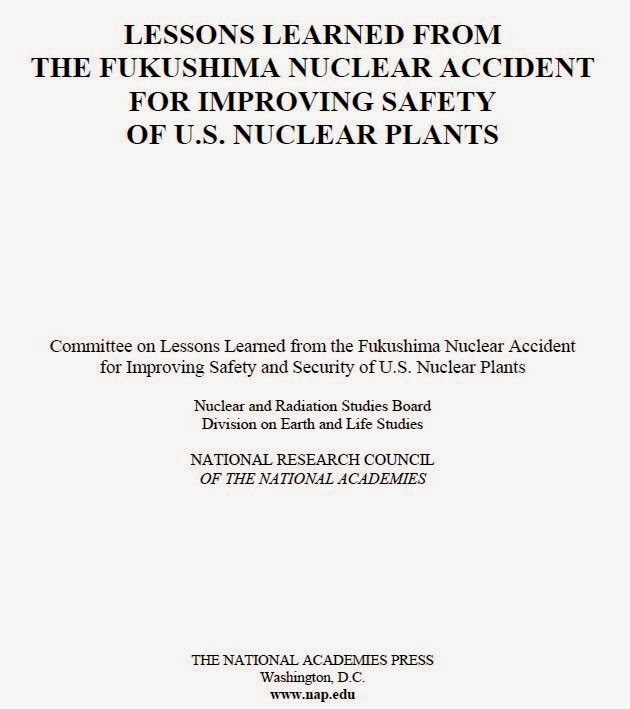 * National Research Council Committee on Lessons Learned from the Fukushima Nuclear Accident for Improving Safety and Security of U.S. Nuclear Plants, “Lessons Learned from the Fukushima Nuclear Accident for Improving Safety of U.S. Nuclear Plants” Prepublication Copy. Downloaded July 26, 2014. The National Research Council is part of the National Academy of Sciences (NAS). Thanks to Bill Mullins for bringing this report to our attention. ** The technical advisor to the committee was Najmedin Meshkati from the University of Southern California. If that name rings a bell with Safetymatters readers, it may be because he and his student, Airi Ryu, published an op-ed last March contrasting the culture of Tohoru Electric with the culture of TEPCO. We posted our review of the op-ed here.